It’s Easter. It’s Passover. It’s, it’s both and April Fool’s Day too! In some years, Passover and Easter fall on the same weekend, and 2018 is one of those years. A festive yet reflective holiday that celebrates the Jewish exodus from slavery, Passover has its own cherished food traditions. 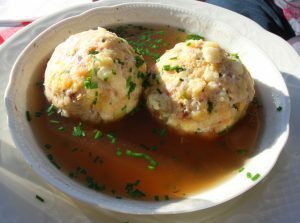 For many folks, the star of the Seder (the ceremonial dinner held on the first two nights of the festival) is the Matzo Ball Soup. Here’s our take on it. In a large bowl, combine eggs, schmaltz or oil, stock, matzo meal, and nutmeg. 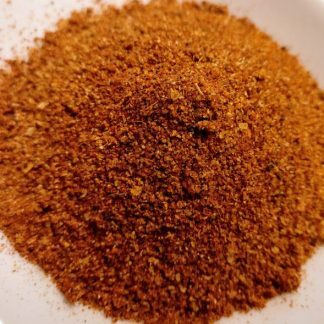 Season with 1 teaspoon Garlic Salt and a few grinds of pepper. Gently mix with a whisk or spoon. Cover and refrigerate until chilled, about 2 hours. Fill a pot with water and bring to a boil, lightly salt. With slightly wet hands, take some of the mix and mold it into a small ball (about 1¼”). Carefully drop it into the boiling water, repeating until all the mix is used. Partially cover the pan, reduce heat to medium and cook matzo balls for 30 to 40 minutes for a firm matzo ball, longer if you like them fluffy. To serve, place two or three in a single serving bowl, spoon hot chicken broth or vegetable broth over them and serve immediately. Of course, you shouldn’t forget the brisket. 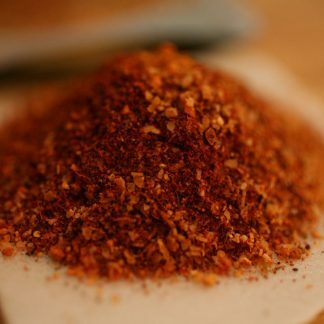 We love seasoning brisket with VSpicery’s Herbal Crust seasoning and for an Eastern European kick add some Smoked Hot Paprika. Easter, so much fun. Coloring, hiding, and finding eggs. If you have thought about coloring eggs naturally, we can say that it really works. Too many websites toting how to, so look it up. 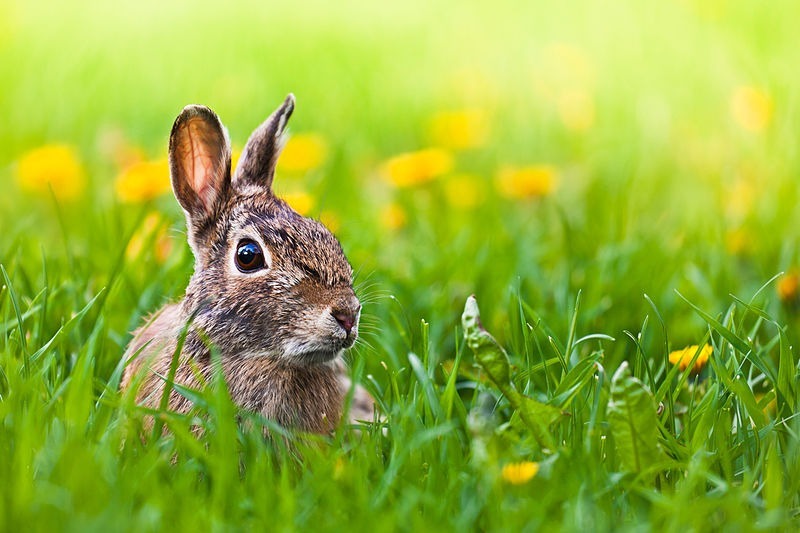 Easter Sunday, a day to celebrate and feast. Growing up my Mom would make roasted leg of lamb, mashed potatoes, a green vegetable, salad, rolls and her famous Lemon Meringue Pie. Good memories. We like to take these memories and update them. A boneless leg of lamb stuffed with cranberry, apricot and herbs, mashed potatoes a la Herbs de Provence, roasted asparagus, salad, rolls and dessert. This is a delicious and easy to make meal. Here’s our big recipe share for the meal. Warm the Cognac and water in a small sauce pan. Add cranberries and apricots and set aside until plump. In a small food processor pulse the fruit and any unabsorbed liquid with almonds, shallots, butter, fennel seed, ½ tsp salt and pepper to taste. Pulse until coarsely chopped. With a boning knife or other large thin knife make a cut 3 inches across in the center of the roast. Gently push and work the blade in and straight through the roast to the other end. Insert the narrow end of a wooden spoon into the opening to widen it a bit all the way through. Push the stuffing into the lamb working first from one end and then the other filling to the center. 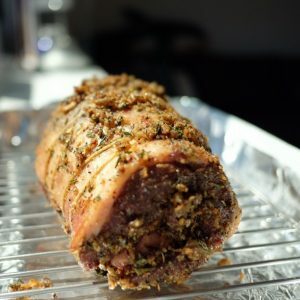 Preheat oven to 350 degrees; pat the lamb dry and season all over with salt and pepper. Heat the oil in a large ovenproof skillet over a medium-high heat. Transfer the skillet to the oven. Roast the meat side down for 1 ½ hours. Let rest for 10 minutes before carving. Whisk the Crème Fraiche or Sour Cream with the mustard in a small bowl and season with salt and pepper to taste. We hope that whichever Holiday you are celebrating, the celebration is a grand event. Next post: VSpicery’s Knife Skills Day!